"There are no words to describe certain attractions. The Guitar and I have been best friends since I was a little kid." 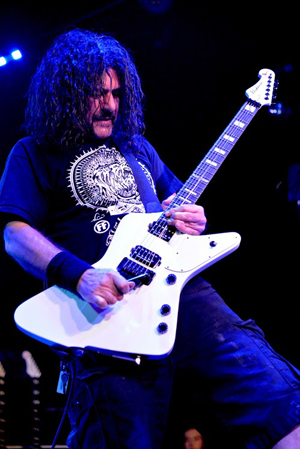 Marzi Montazeri is a well known musician's musician & he has been a staple in Houston, TX's rock venue & club scene for many, many years. He is known for his melodic guitar riffs & unique playing style. 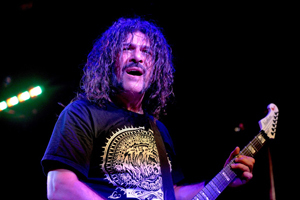 As the former guitarist for PHIL ANSELMO & THE ILLEGALS, he has performed all over the world. Thanks in part to his unique playing style, he also performed in 2015 and NAMM'S 2016 "Randy Rhoads Remembered" - Celebration of life & charity event for the late, great Randy Rhoads, formerly of Ozzy Osbourne, who's life was tragically cut short on March 19, 1982. KNAC.COM: How did you get started? And who or what inspired you to veer towards a career in music? MONTAZERI: I've had a love affair with music from a very young age and it was a calling that I had to answer. I just knew early on that this was what I wanted to do in life even though most of what goes with it in the business I do not like. I still sacrificed to get the job done as a whole in my life by being a true musician. KNAC.COM: How & why did you gravitate towards the guitar? Are you self-taught or did you have professional teachers? MONTAZERI: There are no words to describe certain attractions. The Guitar and I have been best friends since I was a little kid. You know when something always inspires you and teaches you throughout your daily life without judgment, it creates an open field of gratitude for being alive and to actually experience the chase after the notes that I hear in my head. As much as I wanted to get lessons when I was younger I just could not afford them and my Father was not supportive of it so there was no help there either. He was the only family I had living in the States at the time so without his blessings towards it I just dove in trying to figure it out on my own and I am still to this day learning and discovering new sounds and techniques. It's a never ending quest that has taught me a lot. KNAC.COM: What was the name of your first band and in what way did that first band experience contribute to where you are today? MONTAZERI: The name of my first band was called ZEPHYR named after a poem my grandfather had written. Our first show at the 8th grade talent show was a game changer in my life. The jolt that I received that day has still lasted me this long and has pushed me to fight for the truth in music in a world of deceptive cowards. A fight that I will never give up and will always prevail. KNAC.COM: Who is your favorite guitarist of all-time? KNAC.COM: Is it true that you actually were a personal friend to Dimebag Darrell? Did he influence your playing style in anyway? MONTAZERI: Yes it is very true. My bond with Darrell was one of a kind. I've never met and got along with another guitar player like that. We had mutual respect and we came from the same school of players. We'd laugh our asses off on jokes and pranks, smoke out, he'd get me drunk, wasted and share personal demos. We once even recorded a song together. Darrell inspired me but my influences were intact prior to meeting him as was the case for him also. KNAC.COM: I've recently read that you've been conducting Guitar Teaching Clinics here in the Houston, TX demographic area and that you actually recently held the last one in Central America. How did that come about? And what was it like performing there? Do you believe that music has no barriers and that it is universal after having taught in a foreign country? MONTAZERI: Washburn Guitars and Randall Amplifiers put together a terrific run for me through Central America doing guitar clinics in some great music stores along with national radio and television interviews talking and demonstrating my sound and style of playing. Music without a doubt is Universal and has no boundaries. This is most evident when one travels and bears witness to different cultures, languages and lifestyles. The beauty of the experience is sharing the love that I have for music. Through the selection and variety of songs and signature guitars that I bring with me for the clinics, the audience and I immediately bond like family. It was a magical experience filled with lots of love and great food HA! I was blessed to have met so many wonderful human beings. I am definitely doing it again and again but in different parts of the world. The clinics are very intimate. I perform but I am theirs for the time being. I answer all questions and at the end anyone's welcome to check out my pedal board or my guitar. Just ask the ones that were there. We had a great time at that and we will again! 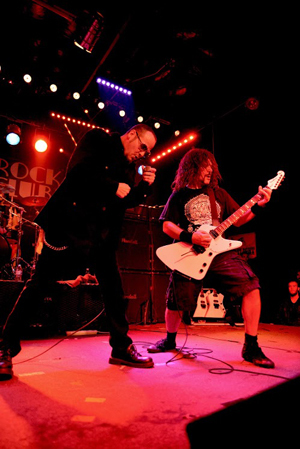 KNAC.COM: I was fortunate to catch your "Special Engagement Show" with HEAVY AS TEXAS and Tim "The Ripper" Owens on vocals at Houston, TX's BFE Club awhile back and it was simply AMAZING! Can you tell us how that union came about? And have you continued to collaborate with Tim and/or do you two have any plans for anything in the near future? MONTAZERI: A long time ago after my band HEAVY AS TEXAS performed a blistering set in Houston Texas, Bobby Blotzer of RATT came backstage to show love and give me compliments on my southern metal style of playing. We hit it off real well and to this day I love Blotz like a brother. Shortly after, he got in touch with me to do a JUDAS PRIEST song to have in a tribute record called Hell Bent Forever. I was stoked but had no idea who was gonna do the vocals till I got to the studio. Tim had finished all his tracks before I even got there and it was truly amazing to hear what he had done. On top of it, he was/is as cool as they come. Cracking me up with his jokes and just a delight to be around. Tim and I are finishing up a full length album and I am sure we will support it when our schedules allow. KNAC.COM: You were one of the musicians who participated in the "Randy Rhoads Remembered" 2015 & NAMM 2016 celebration & show. How were you selected to play as a guest artist? And what was it like performing with the legendary Rudy Sarzo as well as a slew of other industry greats? Were you a fan of Randy's and did he influence your playing in anyway? MONTAZERI: Randy's music and playing style was a key element in my upbringing as a guitarist and a songwriter. He did so much and always was striven to be better. It was an honor to be selected among such great guitarists of our time to pay tribute to an absolute great. Rudy Sarzo I have loved and adored since I can remember. I met Rudy right after we finished playing onstage! He walked towards me to shake my hand and said great job, I said I love you man, then he goes come here and gives a brotherly hug that I will always remember. Rudy Sarzo is the real deal. One of the best rock bassist of our time. KNAC.COM: There have been several significant milestones in your career including the fabrication & introduction of the "Marzi Priestess" Washburn guitar. What an honor! How and when were you approached about creating the "Marzi Priestess"? And how involved in it's design were you? Can you give us a brief description of some of it's features? MONTAZERI: Growing up a Guitar lover of all sorts I never had my eyes set on a signature guitar. I was thinking amps first but this blessing offered itself to me and I got right to work. I had a design already and so did my co-designer Greg from Holland. We were in different realms as far as shapes and curves were involved. We played back and forth for a couple of years and finally my signature guitar The Priestess by Washburn Parallaxe was born. It's a one piece solid mahogany with an ebony 24 fretboard jumbo frets I might add and custom Seymour Duncans pickups along with the Floyd Rose tremolo system. It is absolutely unique in it's tone and play ability. KNAC.COM: With the loss of several industry greats including Joe Cocker, Lemmy Kilmister, David Bowie, Glenn Frey and more recently Prince, does their loss give you pause to reflect on your own mortality? MONTAZERI: I am constantly reminding myself daily and this is nothing new, it is life and we are here visiting for a short time. I am aware of that and I try to do the most I can. KNAC.COM: What is your proudest accomplishment? What kind of impact and musical legacy do you hope to impart on your fans? MONTAZERI: Building a true fan base based on love and my musical style as the core for it's strength and the introduction of the Priestess. Same that I have now which is do it with all you've got and leave nothing behind. One love as the answer. KNAC.COM: Are you currently working on any new material with your solo project HEAVY AS TEXAS? And if so, is there a targeted release date? Will there be a supporting tour to follow? MONTAZERI: I've got a solo record that I am doing with some incredible talents and also a HEAVY AS TEXAS record along with a full length with Tim Owens on vocals. More details and info coming in the very near future. KNAC.COM: With the ever increasing demand from fans to be able to interact with their favorite musicians, what is the best social media outlet for your fans to reach you at? How accessible to them are you? And will they actually get a response from you? MONTAZERI: I am on social media and it's not hard to find Marzi Montazeri online (insert smily face). I try to get back to as many fans that I can based on time availability. I am here to help others but I'm not here to enable users of sorts and robbers of time or I wouldn't have the time that I need to myself to be creative. KNAC.COM: Do you have any parting words for your fans? MONTAZERI: Absolutely. We are one strong family that cannot and will not be divided by greed because we rule with the power of love! I LOVE YOU ALL!